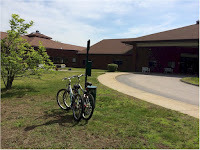 On Saturday we did our first bike ride of the season, taking a spur on a rail trail that ended a half mile from the snf where one of our elders lives. So we biked up the road to see her, went out to lunch afterwards, and got back on the trail. Multipliers, you may recall, are "activities that meet more than one goal." Don't confuse multipliers with multi-tasking. Multi-tasking is the attempt to do more than one thing at a time, which has fallen out of favor, since researchers say all multi-taskers are doing is switching back and forth between tasks, not doing more than one thing at a time. With multipliers, on the other hand, you are doing only one thing. This one task, though, serves more than one goal. So while you're not trying to do more than one thing, you're trying to do one thing that will serve you in multiple ways. It might help to think of multipliers as killing two or more birds with one stone. Increasing my walk/bike mileage for the week. Why Should You Care About My Biking? My bike riding multiplier is an example of how we need to be managing all our time, work time and free time, in order to find or make hours for things we want to do. Like writing. Addressing those three goals separately last Saturday could have taken me all day. I took care of all of them in half a day. If I hadn't stopped for lunch, I could have done it in less. That left me with another half day for other things. As a general rule, when this happens for me it's accidental. It's rarely a result of real planning. Trying to spend some time at the beginning of each week planning for one multiplier would be an interesting exercise.